Air is the new oil! That’s according to Gordon Ramsay, one of the most popular chefs of today. Ramsay had to check out some Philips Air fryers and he had very good words about them. It was not until this time that I started to create some interest in these kitchen appliances. The buzz around air fryers in their early days was so much you might feel like you’re being bullied to part ways with your cash. But if you really take some time to use or study some of the best air fryers, you would realize how nice and easy these appliances can handle cooking in the healthiest way possible. Can you imagine frying your favorite French fries without the usual cups of oil? How about frying chicken with no oil too? One may feel this is impossible, but with any of the best air fryer, impossible is just a word and nothing more than that. You see, as great as these kitchen appliances can be, cooking with a mediocre air fryer may ruin your air frying experience. There are a lot of these oil-less fryers on the market, so how do you avoid the mediocre ones? By going for the best air fryers. So right here, we present to you, ten of the best air fryers of 2018. Any of the air fryers below will wow you and make your cooking experience as healthy as it can ever get. The Philips Air fryer XL claims the top spot on our list and this won’t surprise most air fryer enthusiasts and experts. Philips paved the way for other manufacturers when they released the first air fryer in 2010. Since then, a lot has changed. This Philips XL though is one that can confidently claim the top spot on our list of the best air fryers. Talk about the unique starfish design for fast and even cooking, the air fryer has it all. This Philips XL air fryer, HD9240/94 has a capacity of 2.65lbs. The capacity will feed a family of four without problems. Also, the air fryer has a footprint that is moderate when you compare it to others. It measures 12.4 x 16.65 x 11.89 and has a weight of 18.98 lbs. 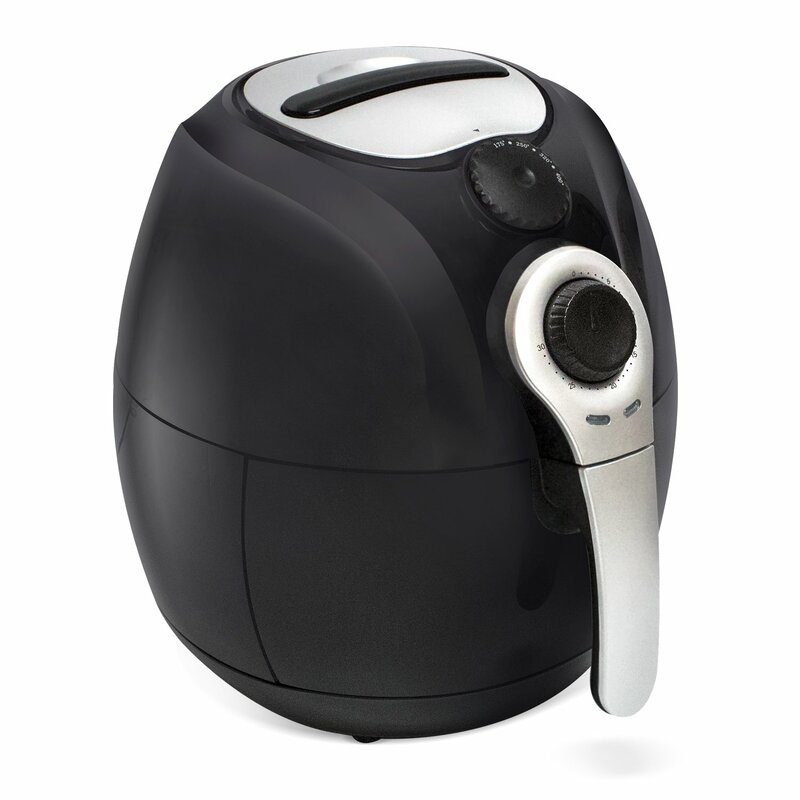 The air fryer utilizes the patented rapid air technology to cook foods. This works by circulating super-heated air around your food at a super-fast speed. To ensure the food cooks properly, the air fryer distributes the heated air evenly around the food. The Philips XL has a digital touch interface. This makes cooking easy. The control is also able to memorize certain settings for the favorite foods you cook often. This is the function of the Smart Preset feature. The air fryer also has some preset options which you can use to cook certain foods at the touch of a click. This is fast and good for people who don’t have much time on their hands to cook. Just load in your food, click a preset key and you can eat in a few minutes. The stainless steel heating element has a power rating of 1750W while the voltage rating for the air fryer is 120V. The air fryer air fryer has a removable drawer. All you need to do is draw this out and load in all of the chips, chicken, vegetables or any of those foods you’d like to cook. This is easy and anybody can use the air fryer without troubles. The air fryer has features for both adjustable temperature and time. You don’t have to keep guessing around. And, just in case you forget the food you’re cooking, the air fryer has a 60-minute timer to make sure your food does not become a burnt offering. Same way you can easily use it is the same way you can clean it. The fryer has dishwasher-safe parts that you can clean easily. Just remove these and toss them in water. It’s so easy and quick. A large enough family-size capacity. Comes a recipe book and an app with over 150 of the best air fryer recipes. Highly versatile, can grill, roast, sauté, bake, and steam apart from frying. Highly safe to use, has an auto-timer and cool-to-touch heat-proof exterior. Digital interface for quick and easy cooking. Healthy, oil-free foods with rapid air technology. Though the air fryer has a moderate footprint when you compare with others, it still is somewhat bulky. You’ll need a little bit of space to fit it in your kitchen. That’s the way with most air fryers though. Although it is very easy to use, you’ll still need to learn a thing or two. 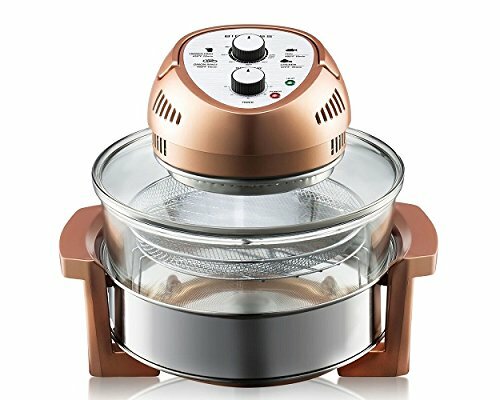 To get the best out of your air fryers, this is necessary especially in the case of air fryer recipes and cooking guides. Now, the GoWISE Air fryer shows you can enjoy healthy foods without breaking the bank. It has all the important features a premium air fryer should have and still retails below the $100 mark. This air fryer is perfect for cooking almost all of those foods you’d want to try in an air fryer. It uses rapid air technology which is necessary for fast and even cooking. The digital control features a 7-in-1 smart preset which you can use to cook anything at the press of a key. It is pure class and premium quality coming at a much affordable price. Rapid Air technology is the pacesetter for fast and even cooking. These results are delicious and crispy foods. The GoWISE Air fryer makes use of this technology to cook your foods. This air fryer has a 3.7qt capacity. It measures about 9 x 8.5 x 12 inches and weighs 12 pounds. The affordable GoWISE has a one-touch digital control interface for settings. You can adjust the time and temperature from here. The air fryer has a 30-minute auto timer and a temperature range between 175 to 400F. Looking for the best air fryer recipes? Look no further. This GoWISE air fryer comes with a voluminous recipe book. You can always learn about your favorite meals and it can also help to build your culinary skills. Don’t want to spend time inputting settings? Choose any of the 7 smart preset and you are good to go. The settings are for fish, meat, fries, veggies, steak, chicken, pizza and much more. The fryer has a digital panel for easy use and cooking. It also has dishwasher-safe parts for easy cleaning. The air fryer has an auto-timer to prevent burns and overcooking. It comes with one of the best air fryer recipes book. The warranty does not cover all parts of the products. You’ll need to be really careful so you don’t break a part of the air fryer that is not covered by warranty. The non-stick coating may peel off after a long time of use. Want to enjoy cooking healthy foods even with a low budget? The Power Air fryer XL presents you with an unlimited world of possibilities. This air fryer comes with a 3.4qt capacity although you may want to go for a larger model. The air fryer has a one-touch digital interface. You can control all of the settings from here. The air fryer can heat up to as much as 400F. It has a power rating of 1500W and it’s one very easy-to-use air fryer. Allows you to cook foods evenly and faster. This air fryer also makes use of turbo-cyclonic power to provide you with the best cooking results. This model has a 3.4qt capacity. 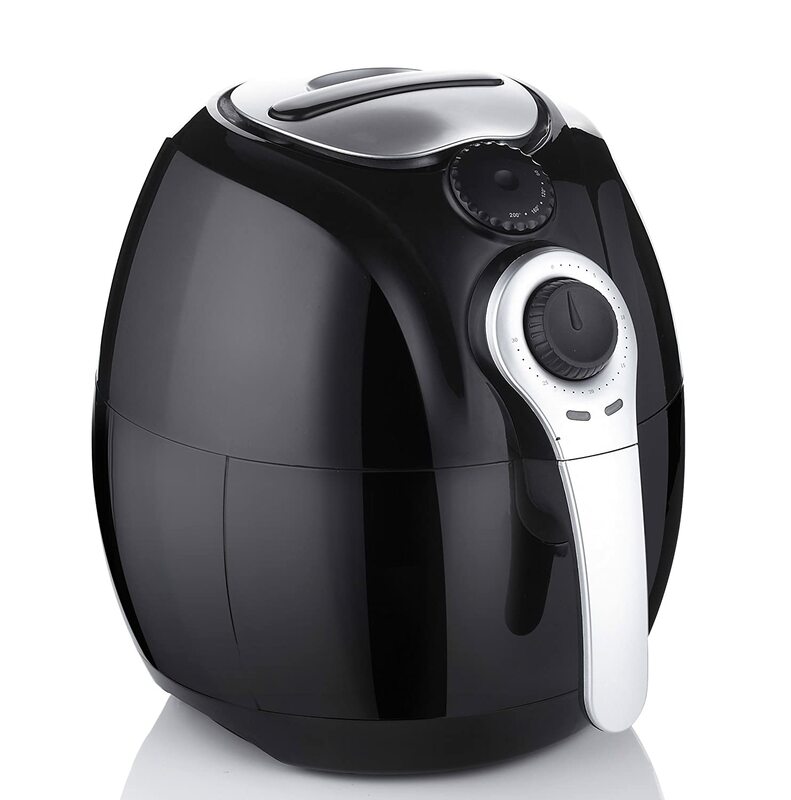 The Power Air fryer weighs 13.9pounds and measures 15 x 13.5 x 13.3 inches. The fryer has a one-touch digital control panel. This interface makes it very easy to use. It comes with 7 preset programs for fast and easy cooking. You can also adjust both the time and temperature from the digital panel. You don’t just fry, you can also cook different types of food with this air fryer. The size allows you to cook more. Even if this is not enough, there is a larger capacity model you can still go for. 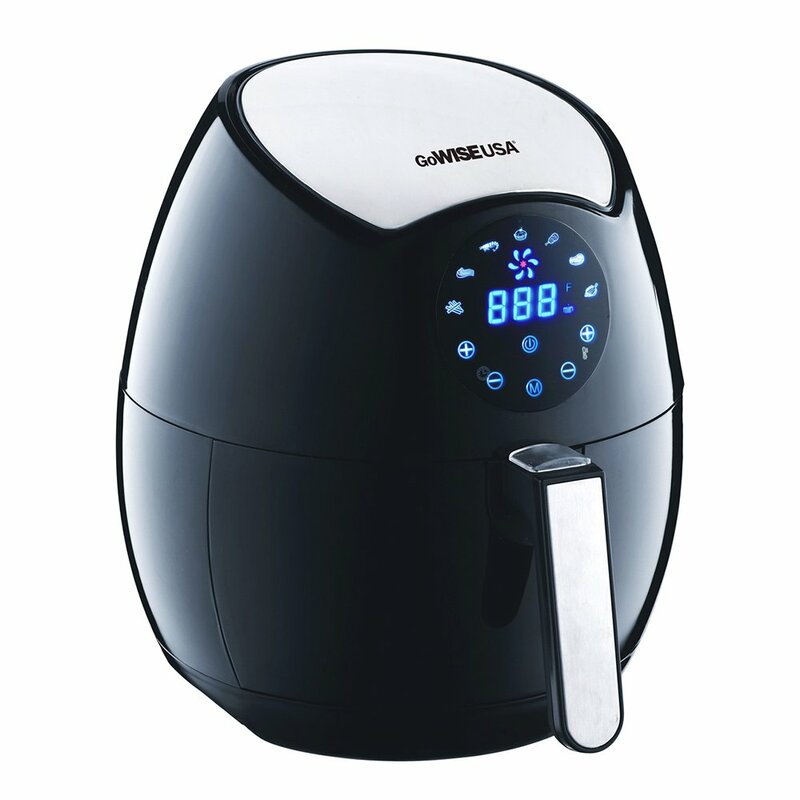 This air fryer is available in two colors which you can choose from. Black and red. Power Air fryer has 6-in-1 cooking features for baking, steaming, sautéing, grilling, roasting and frying. The interior is non-stick. It may be challenging to remove food sometimes. Also, the air fryer can get so hot at times. You’ll need to always pay attention while cooking. Looking for the perfect air fryer for French fries? 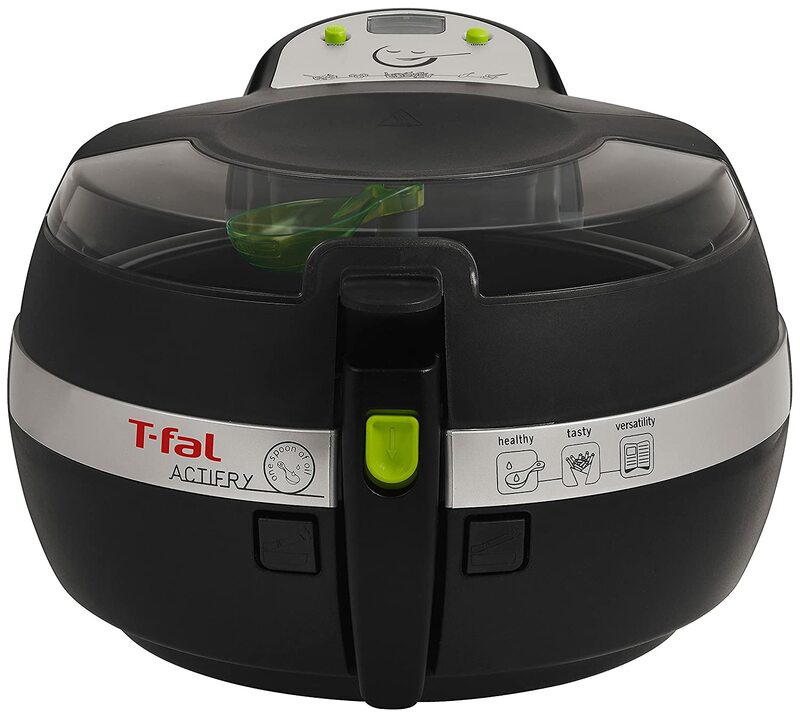 Then this Tefal Actifry may be what you need. This air fryer is different and unique. It is only one of the few air fryers that come with a stirring paddle. You don’t have to shake the fryer around when frying your chips. Moreso, the air fryer can cook with as little as a half tablespoon of oil. 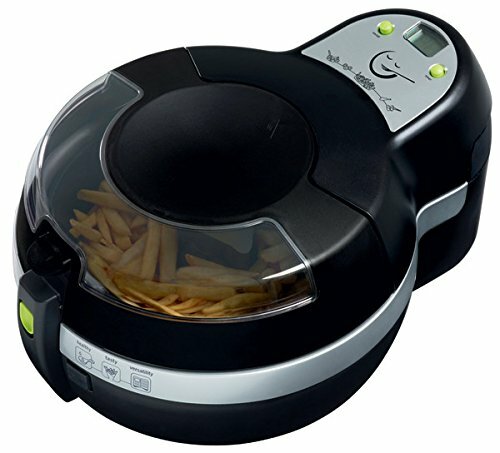 French fries cooked with the Tefal Actifry are delicious and have the crispy outer feel. Want to see how your food is cooking? Then you can peek through the see-through lid. The lid is highly secured and protected against mishaps while you are cooking. The T-fal FZ7002 has a capacity of 2.2lbs. This will hold foods up to a weight of 1kg. The air fryer weighs about 10.9pounds and measures about 11.75 x 19.1 x 15.6 inches. This air fryer works by using the Airfry Technology. 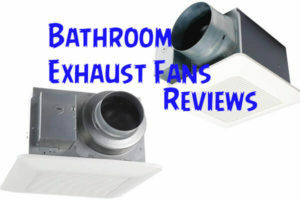 The technology uses its patented heat pulse system for a highly optimized circulation of hot air. This is not only fast but also ensures even cooking. There is a large LCD screen. It also has a countdown timer. There is also a removable ceramic-coated pan along with a paddle. While all of these makes sure the Actifry is very easy to use, the removable and dishwasher-safe properties of the cooking parts also make it easy to clean. The Tefal actifry comes with a recipe book containing 38 of the best air fryer recipes. You are in for an adventure with this. You can try out both familiar and even totally new healthy cooking recipes. It has a detailed recipe book. The fryer has a paddle so you don’t have to shake it at intervals during cooking. There is a measuring spoon for measuring oil. 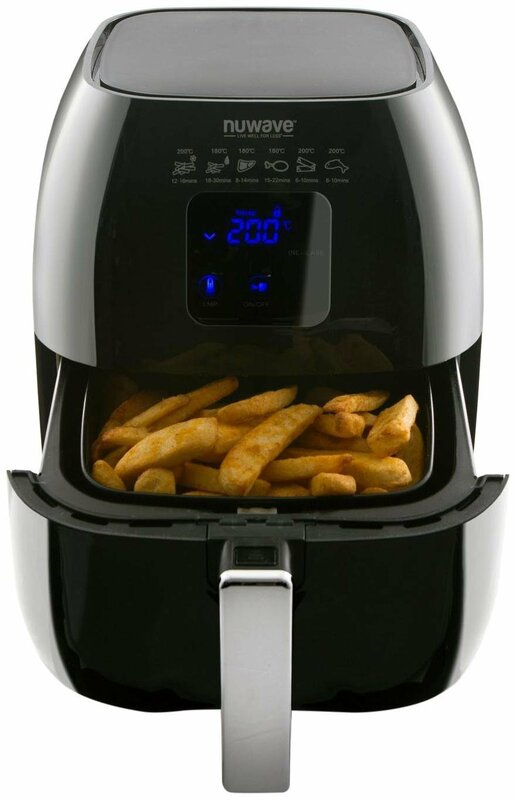 This air fryer will fry your French fries, chicken and many other foods with as a little as a half tablespoon of oil. Results are still delicious, crispy and crunchy. The most notable is the bulkiness of the air fryer. It has a somehow large footprint and will take quite a few space in your kitchen. If you would be cooking for three or less, this inexpensive cooking appliance may be all you will need for healthy, oil-less cooking. The Black & Decker has everything that should be basic for an air fryer. Even with the low retail price, it still has some nice features that will make your air frying experience worthwhile. Let’s check this air fryer out and see all it promises to do. The Black & Decker Air fryer has a capacity of 2L. This is roughly 8 cups and will feed two to three people. You can fry two whole potatoes and up to eight chicken wings. The air fryer also weighs 12 pounds and measures about 11.5 x 11.5 x 13 inches making it have a small footprint. The air fryer uses dual convection fans to circulate hot air around your foods. The food cooks fast and even with the even distribution of the heat circulation along with the power of the exclusive heating element. The air fryer has a 60-minute timer. You can also adjust temperature between 0 to 400F. The air fryer has a cool-to-touch handle. It doesn’t get hot and you can easily hold it to remove or replace the drawer. The air fryer also shuts off as soon as the time is complete to prevent overcooking and burning. The air fryer has dual convection fans. This makes cooking faster. Also, the handle always remains cool throughout the cooking time. It has non-stick and removable parts that you can easily clean after each cooking period. The air fryer lacks a digital control feature. The timer can be hard to adjust at times. This Air fryer is the real definition of value for money. The air fryer retails for an incredibly low price, well below $100. This is despite the fact that it had so much to offer. The fryer does not feature a digital control setting though. Rather, you can adjust the settings manually with straightforward and precise manual knobs. Let’s check out the features in this amazing air fryer. 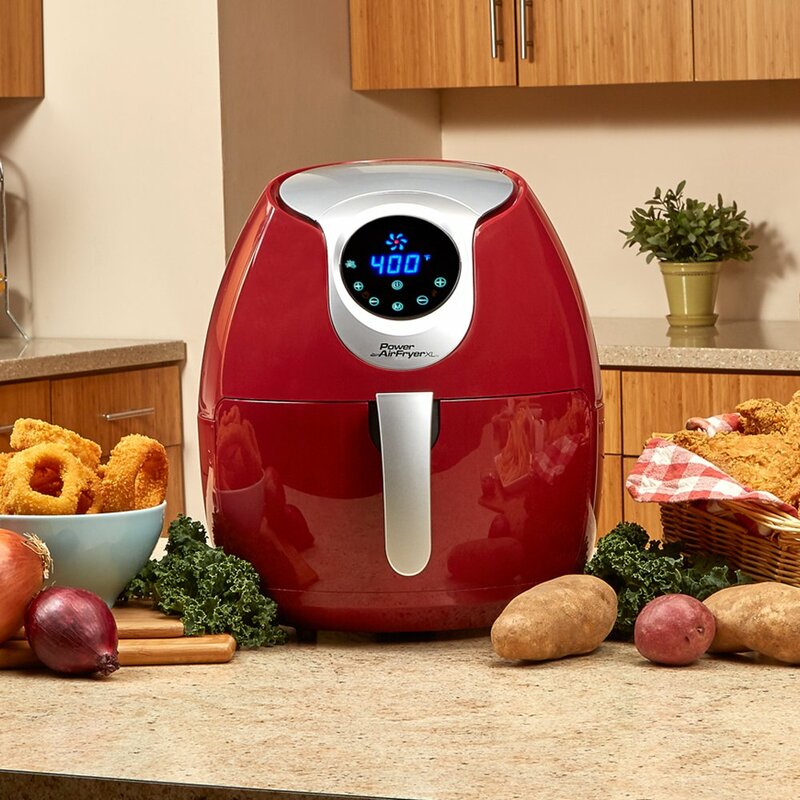 This technology is the reason why the Avalon Bay Air fryer is able to cook delicious and crispy foods at a fast and even pace. The controls are for adjusting and setting the time and temperature. There is a 30-minute auto timer and a temperature level up to 400F. The Avalon Bay Air fryer will cook with up to 3.7qt capacity. It measures 13.5 x 11 x 12.8 inches around and weighs 14 pounds. The air fryer comes with a multipurpose rack, a non-stick baking dish along with a 52-page recipe book. This will end your search for the best air fryer recipe book. The Avalon Bay Air fryer cooks very easy and fast. It comes with a detailed recipe book for some of the best air fryer recipes. There is also the availability of other accessories for versatility and flexible cooking options. The Air fryer is compact. It has a small footprint and will fit nicely on your kitchen countertop. The coating of the plastic exterior may peel off after a while. It may also be difficult to clean sometimes. 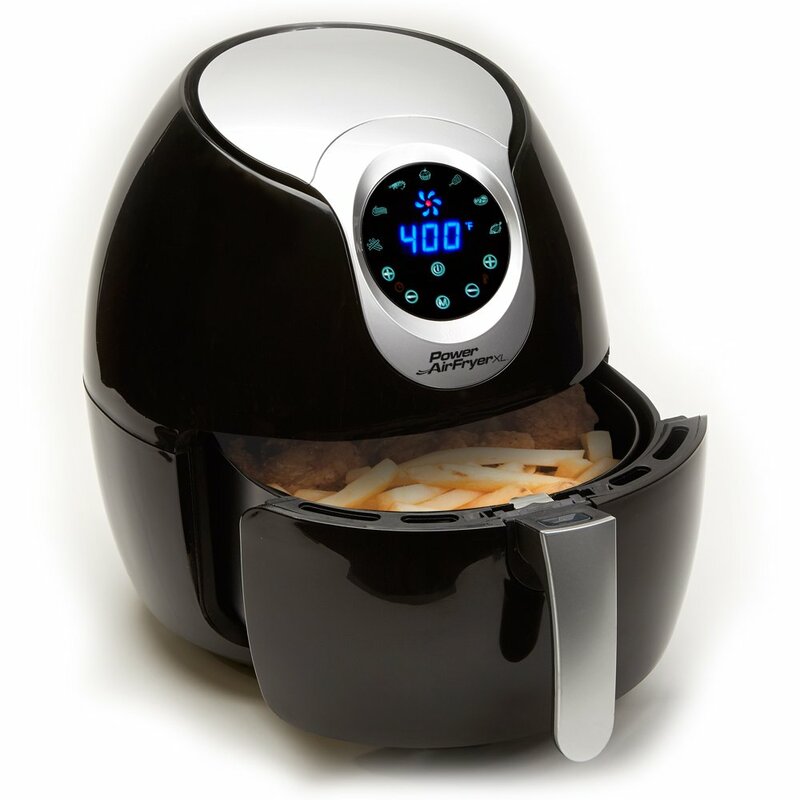 The NutriChef Air fryer has one of the most precise and straightforward air fryer controls. The air fryer offers you a healthy cooking alternative in a convenient and easy manner. You only have to load in your food into the cooking basket and at the click of a button, you can start cooking. It’s so easy you’ll begin to marvel if this is magical. So, how is this air fryer able to do this? 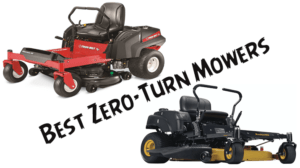 Let’s check out the most outstanding features. The air fryer has a non-stick interior with a basket capacity of 3.2L. This capacity should be enough to cater for a family of three to five. It weighs 9.8 lbs and measures 11 x 11.2 x 12 inches. The rapid air circulation technology in the Nutrichef Air fryer is ideal for even cooking at a fast pace. For safe cooking, the air fryer has an auto-timer that shuts off after 30 minutes. It has a temperature range of 176F to 392F which is adjustable for cooking different types of food. You can grill, roast, bake, steam, sauté and fry different types of food inside one single cooking appliance. The Nutrichef Air fryer is perfect for cooking chicken. They are always crispy and juicy. 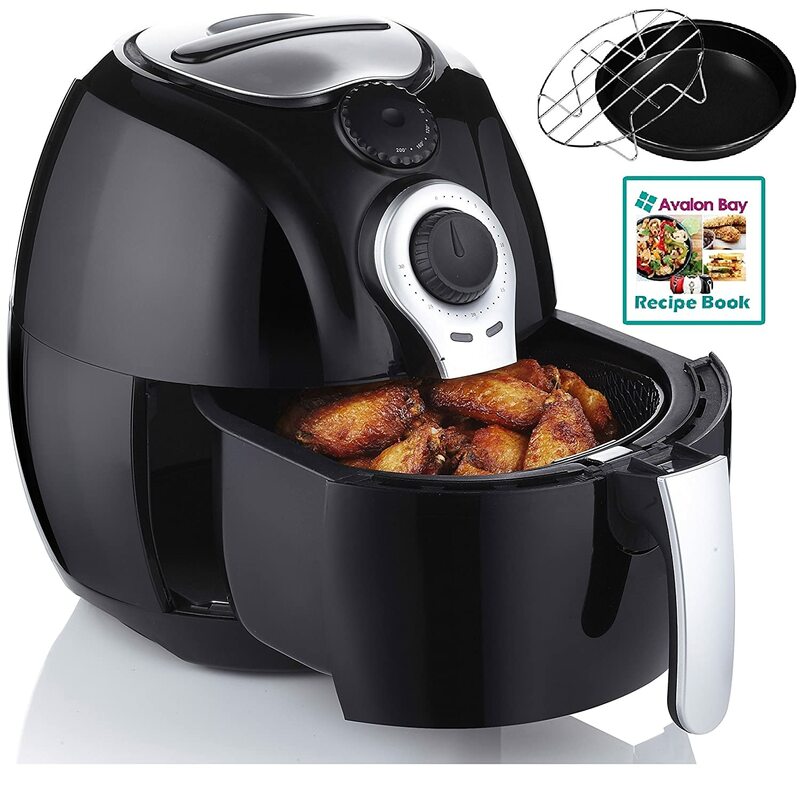 This air fryer is very easy to use because of the straightforward and precise controls. You can easily clean the air fryer because of its stain-resistance design. You get to cook oil-less and healthy food but still very delicious. The air fryer is perfect at handling frozen foods. The fryer is not so very perfect at cooking wet foods very well despite this. Overall, the Nutrichef is perfect for chickens. 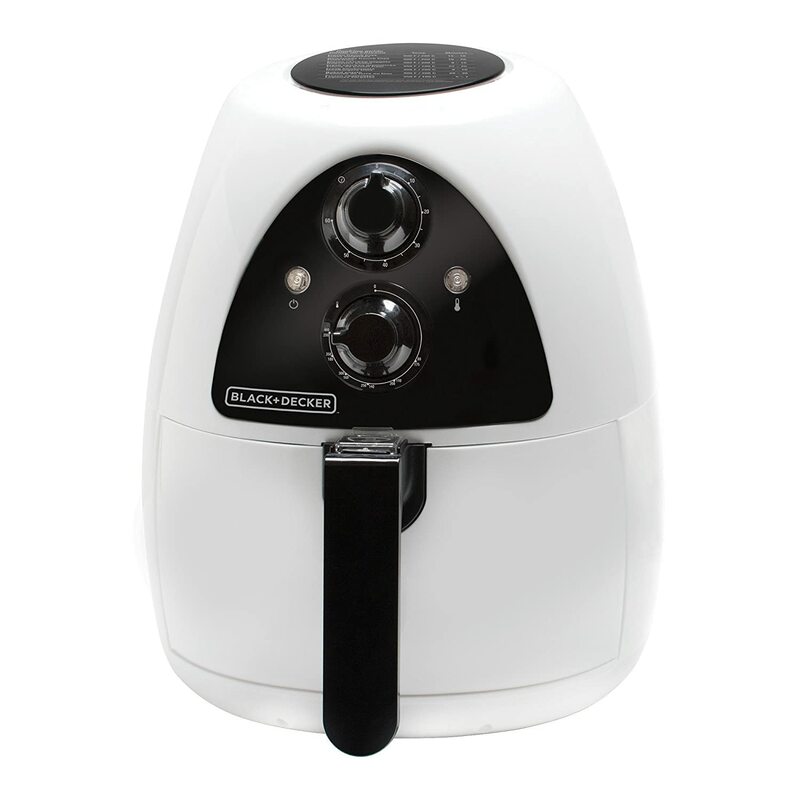 The fryer is very easy to use and it is one of the most affordable air fryers on the market. The Nuwave Brio Air fryer produces one of the best and most consistent results. This is because of the high accuracy of its digital LED controls. The air fryer is also able to adjust temperature between the range of 100 to 390F. It is designed with safety in mind and so it’s highly safe to use. Let’s check out some of the features of the Nuwave Brio Air fryer. The air fryer has a capacity of 3qt. It measures 8 x 11 x 13 inches around and weighs about 8.01 lbs. Apart from the auto timer which prevents overcooking and burning of foods, the air fryer is also designed to prevent the system from working until the basket is properly in place. The Nuwave Air fryer has an inbuilt auto pre-heating feature. This is able to pre-heat the air fryer before cooking to ensure perfect and accurate results. The air fryer has a temperature range of 100F to 390F. This temperature increases or reduces in 5F increments. 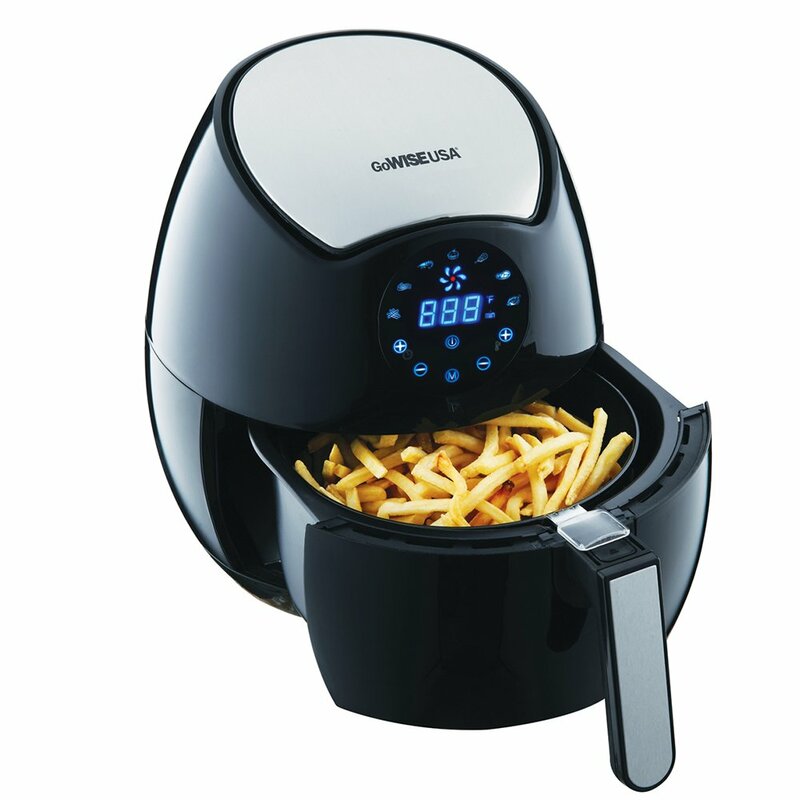 It is a highly affordable fryer, sells just a few dollars above $50. This is great for a fryer of such quality. The Nuwave Brio comes with a recipe book for easy cooking. 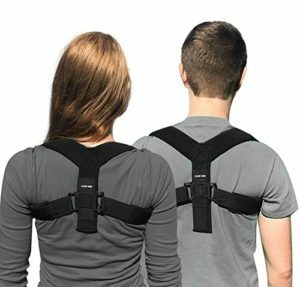 It has a retractable cord, meaning you can easily store it without the cord being a problem. So, the air fryer is not non-sticky. Sometimes, it may be challenging to remove foods without it sticking to the pan. The air fryer is not as versatile like many others on our list. It will only offer you the basics of air frying. You see, the Big Boss Oil-less Air fryer is the biggest boss when capacity is what you need. Unlike many other air fryers with single or family size capacity, this air fryer will serve a party of a few people easily. The air fryer has a transparent body and you can see your food as it cooks with its triple cooking power. Roasting a whole chicken or expecting some guests? The Big Boss will boss it up! Your French fries, chicken wings, fish, and other foods come out delicious and crispy. The air fryer has a whopping capacity of 16 qt. We have talked about that already. The fryer has a weight of 14.7 pounds and measures about 16 x 12.5 x 13.5 inches. The triple cooking power of halogen, convection, and infra-red heat cooks your food evenly and fast. The air fryer has a power rating of 1300W. It also uses a stainless steel heating element for efficient cooking. It has both time and temperature settings. There are also icons to indicate temperature levels for each food you want to cook. The air fryer has a capacity that is enough for very large families. Despite the large size, the air fryer is still affordable and inexpensive. 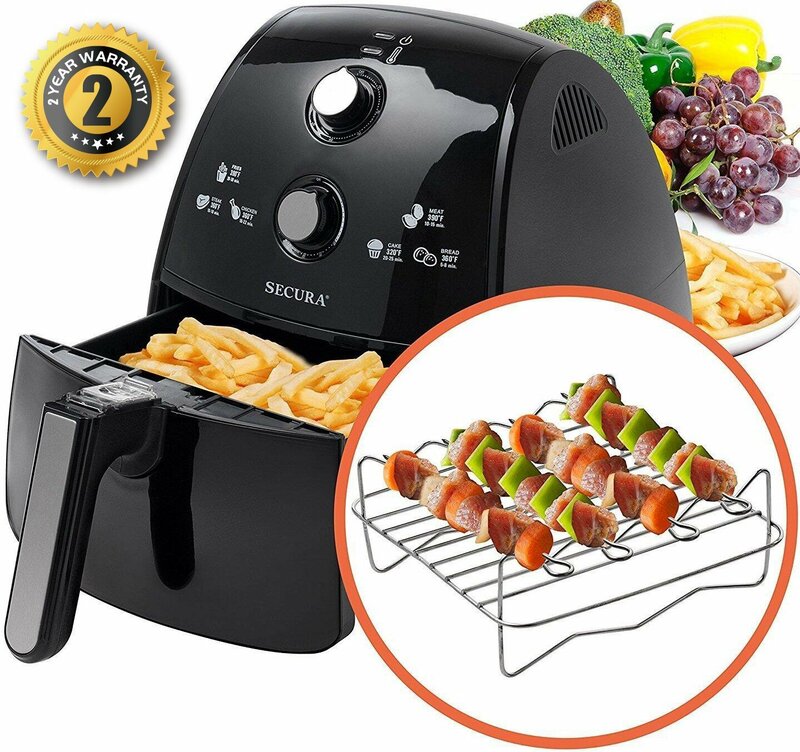 You are able to cook two foods at the same time with its two trays. The lid is tightly sealed to prevent mishaps during cooking. It is available in six different colors, giving you lots of options. The Big Boss lacks a digital control panel for easy settings and accurate results. This manual air fryer is able to roast, bake, grill and fry. It has a 3.2L capacity and comes with a cookbook. The cookbook has over 50 of the best air fryer recipes so you can accurately cook delicious and crispy meals. 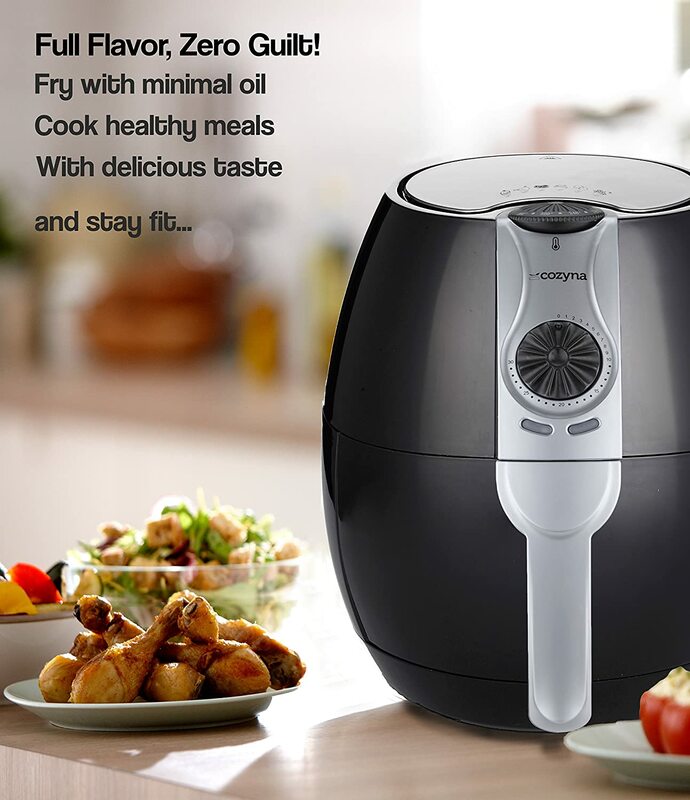 The Cozyna Air fryer cooks food in a healthy manner with as little as a tablespoon oil or less. 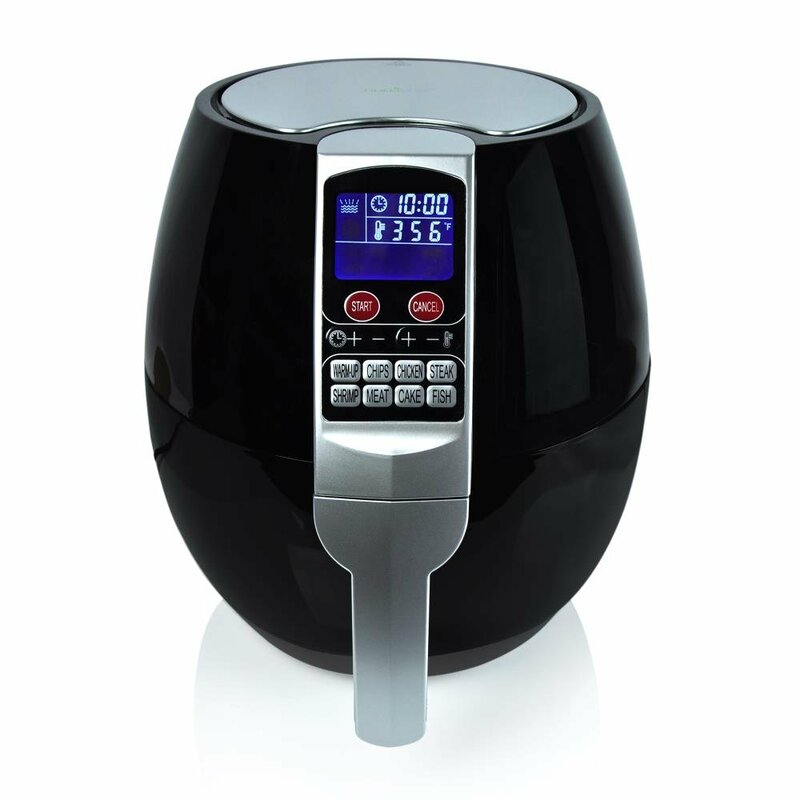 Let’s check the other amazing features of this air fryer sequentially. This Air fryer by Cozyna has a capacity of 3.2 liters. It has a weight of 11lbs and measures 11.5 x 13 x 12.25 inches. The air fryer is an analog model. It uses two knobs to control time and temperature settings. The temperature can get up to as high as 392F. The air fryer also has a 30-minute timer. The air fryer uses Rapid Air Circulation to cook foods. It has a heating element which has a power rating of 1300W. The cooking parts are dishwasher safe so you can clean the parts easily. The air fryer comes with two cookbooks. This cookbook has over 50 air fryer recipes for delicious and healthy meal preparation. The air fryer comes with over 50 best air fryer recipes. It is not bulky so it can easily fit on your countertop. It has a removable drawer and dishwasher safe parts. This is needed for easy use and cleaning. It is often difficult to put in the cooking basket at times. It is important that you consider your options before you splash out the cash. Even though you’ll be okay with any of the air fryers on this best air fryer review, you still need to consider certain things. We’ll consider these deciding features in the next part of this air fryer review. Most times, this may be the most important thing. A family of four will need less capacity than a family of 7. The capacity of your air fryer will go a long way to affect your cooking experience. Most air fryer brands often have XL capacity models. These models like the Philips XL Air fryer can range from between 3qt to 6qt. The Black and Decker will easily support a family of two. The Philips Air fryer XL will manage between four to six people while the Big Boss Air fryer… Well, you can party with the Big Boss Oil-less Air fryer! Air fryers are either analog or digital. The digital air fryers are very easy to control. You can control time and temperature with the click of a button. The manual ones too don’t seem so difficult. They make use of knobs and dials. They may be hard to accurately set sometimes. The Philips XL and the GoWISE USA Air fryers are both digital air fryers. The Black+Decker and the Big Boss are both analog models. Though they do not have a digital touch interface, they still have knobs for precise time and temperature adjustments, unlike most other air fryers. Some air fryers max out at 350F, the least on our list tops at 392F. Air fryers should have high temperature range to properly cook foods. The whole idea about air fryers is this healthy eating thing. If the food does not cook properly, then it will defeat the idea. At least, the temperature should reach 390F and it should be adjustable. This will determine how much space it will occupy in your kitchen. The space you have to spare in your kitchen should be considered before bringing the air fryer home. It would not be fine to have the air fryer looking awkward and squeezed. Though some people get around this by storing the air fryer away completely in another place if the space left in the kitchen is tight. 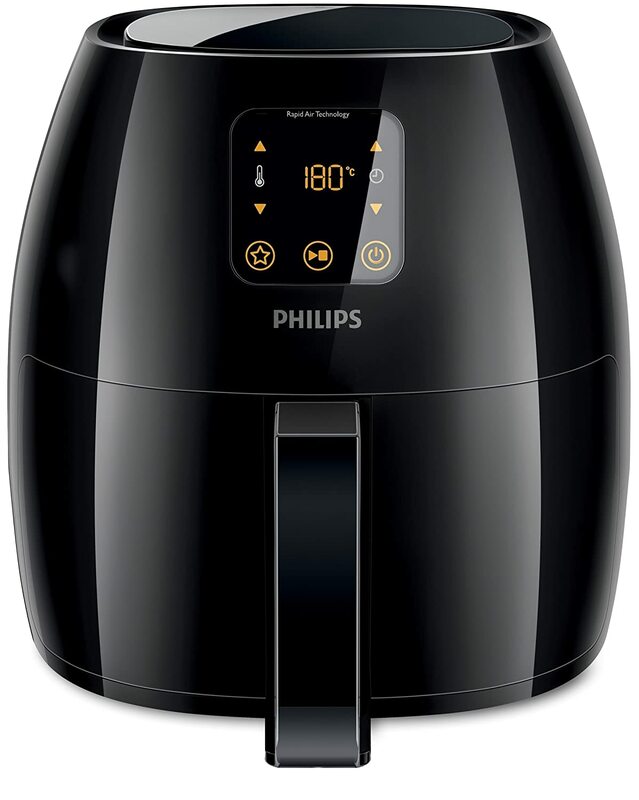 Apart from frying, some air fryers like the Philips XL, the GoWISE Air fryer, and many others on the best air fryer list will perform other cooking methods. They are also capable of grilling, roasting, baking, sautéing, steaming and much more. Air fryer technology is moving at a very fast pace and your ordinary air fryer should not be left out. Non-sticky dishwasher safe parts are the best. Even though the air fryers won’t get so messy because you don’t use oil, you’ll still have to clean it. Having an air fryer with a dishwasher safe part will make cleaning easy. Does your air fryer come with a recipe book? If yes, you are in for an adventure. Even though you can get several air fryer recipes over the internet, having one come with your air fryer makes thing easy. Gordon Ramsay, the popular chef, designs air fryer recipes for Philips and Power Air fryers have recipes. It is good to go for an air fryer with high power wattage. Those air fryers with higher wattage power cook foods faster than those with lower wattage. So, how much control do you have on your cooking? This will be reflected by the type of air fryer you buy. 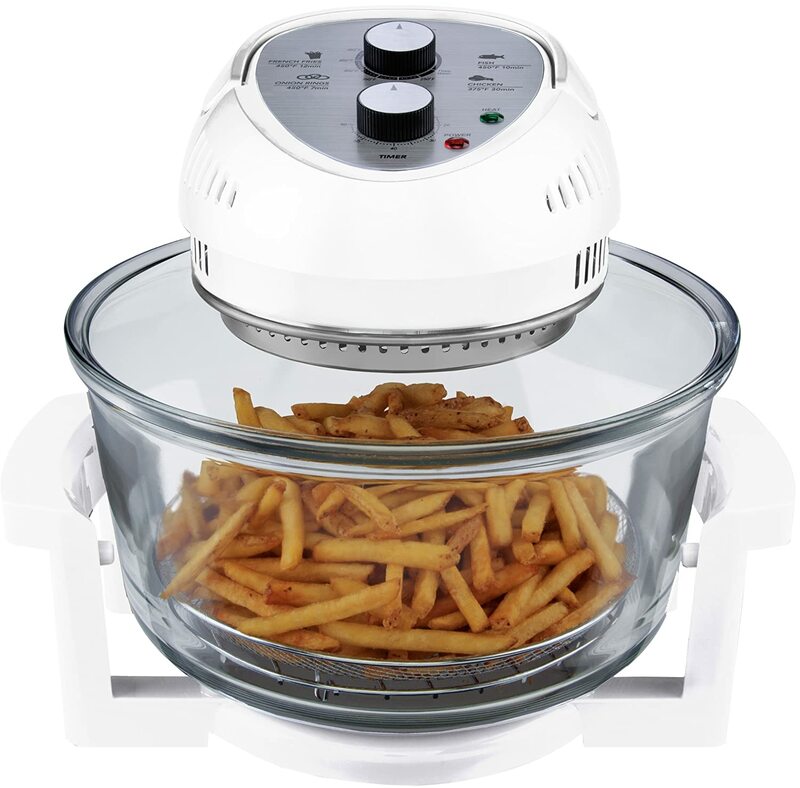 Most of the air fryers in our best air fryer will allow you controls over time and temperature. There are also those that will offer you extra features. The fast cooking smart presets and auto shut-off are also nice features. These may help you decide if you have to choose between two very close models. Philips produced the first air fryers in 2010. Since then, a lot has been improved upon. Air fryers are able to cook foods without using oil. These cooking gadgets work by circulating hot air around your food. Air fryers circulate this air around the food at a very high speed. This hot air is what they then use to cook the food. Now, the absence of oil partially or completely is very beneficial. Some air fryers can cook with as little as half a tablespoon of oil. This helps to reduce the calories by at least 70%. Most air fryers use Rapid Air Technology. Some use Rapid Air Circulation. All of these still function with the same basis of using hot air at a high speed to cook the food. Air fryers are the best alternative to deep fryers. You are able to cook without using oil at all. In most cases though, you may choose to use a little amount. This could be like a tablespoon or half. All the same, the health benefit is still overwhelming. Air fryers will help to cut down fat by as much as 70%! That is a great feat if we are to consider the danger that fat and oil brings to our health. Now, let’s not forget that oil is associated with a lot of diseases. Heart attack and diabetes are both among these. Likewise, obesity and so many other diseases can manifest from using excess oil. And since most of us love these crunchy and crispy unhealthy foods, air fryer then becomes the savior. Also, apart from the health benefits, air fryers cook very fast. They are essential if you are someone with little time or a tight schedule. You can begin cooking at the touch of a button and it the food will be ready in a short time. Most air fryers are dishwasher safe. This means you can toss them in water and clean them with a little bit of dishwashing soap. These appliances are easy to use but they also should be clean and free from food particles. I’m sure you’ll not like flavors of past foods mixing with the new one you’d want to cook. Even though there is not much oil to splatter and mess up the fryer, a little bit of washing with warm water is fine. For some air fryers, you can check the user’s manual for instructions on how to clean them. Most air fryers will have removable cooking parts. The cooking pan and basket are also most times, non-sticky. These removable parts can be soaked in warm water with dishwashing soap for a few minutes before washing. Almost all of the best air fryers on our best air fryer review are dishwasher safe. This does not mean you should throw the gadget into water to wash though. Doing this will severely damage the air fryer. Only the removable cooking parts can be tossed in water if you are to wash them. Deep fryers cook your foods by frying the foods in oil. Though some deep fryers also have filters, the food still absorbs substantial amount of oil. Normally, frying makes the food flavorful and gives it a crispy feel on the outside. But the dangers of this cooking method outweigh the sweet taste. These oily foods are responsible for some diseases. The diseases include heart attack, obesity, diabetes and a host of other medical conditions. But how do we cook French fries and deliciously fried chicken wings? Is it possible to enjoy the same great taste without all of the health implications? YES! Now, it is possible. Simply cook with an air fryer. Now, an air fryer will use hot air to cook your food. If at all you’ll need oil, it will be so little that it won’t pose any significant threat. You can cook with half a tablespoon of oil or less and still enjoy the same delicious and flavorful foods. The air fryer circulates hot air around the food. Using hot air helps to reduce the fat in our foods by up to 80%. Unlike deep fryers, air fryers provide the best way to enjoy your favorite dishes without worries about your health. Air fryers are one of the best inventions of the modern day. These gadgets are really wonderful and great. You are able to enjoy great taste in meals in a responsible and healthy manner. All of the air fryers on our best air fryer review will cook healthy food. Now, the one you’ll choose at the end will be based on personal choice. Choice in this form refers to capacity and the other features. So, right now, these are the best air fryers on the market. 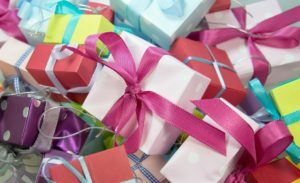 Whichever one you end up buying, you’re sure of getting good value out of your product.